The purpose of this exercise in historical medical geography research is to try and apply new knowledge and technology to an older disease in an attempt to better comprehend the disease ecology and epidemiological belief during the time that this map was made. For the time being, the exact date and source for this disease map is unknown. What can be told based upon its contents is that it was produced before the germ theory took hold in the medical world, making its data some time before the late 1880s. The information on this page was developed in three parts. 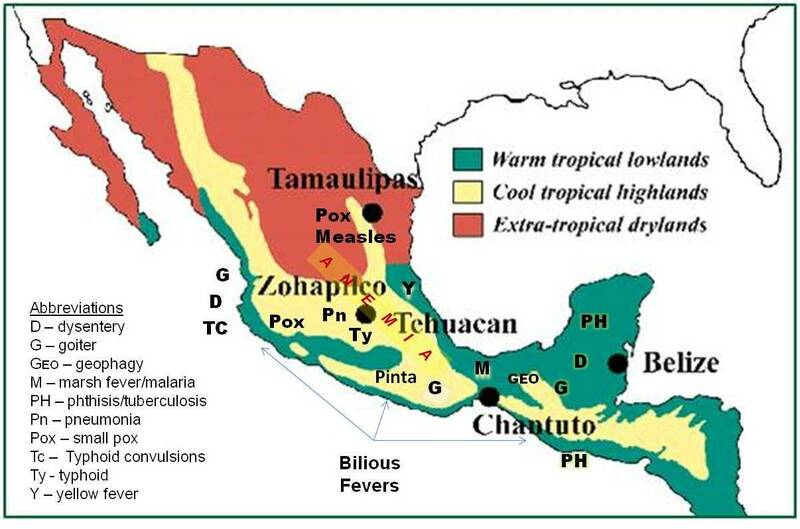 The first part provides an overview of the disease map, followed a review of the spatial relationships of disease in relation to three climate regions defined for Mexico (based on a name with pre-Columbian place names); parts of this section were finished as the true identification of each disease became apparent during later studies. The second part reviews each individual disease in a little more detail; during this part of the review, attention is paid to trying to identify the diseases named on the map. Since many of these names of illnesses on the map could refer you to one or more condition, a little more attention is paid to trying to mroe accurately identify the actual illness or illnesses referred to, and if applicable identify when the name of the illness in one location refers to a related or totally different illness by the same name in another location. The third part of this review covers these illnesses separately, or if applicable and necessary, as a group of disorders that are historically and medically related. An interesting thing about disease ecology maps is each has underlying stories that can be told about the illness or medical condition displayed on the map. This map was produced around 1880, and unfortunately was purchased as a single page cut from a magazine; no knowledge or connection to its original source could be provided to me. It is best interpreted as a thematic map. It has no defined projection, and the scale is unusual depicting 620 miles in length. The choice of this distance is possibly related to the size of the area reviewed, such as a measure of the maximum east-west size of the land mass (620 miles = 1054 kilometers). The areal locations of 14 disease identifications are roughly displayed. The nomenclature for each of these diseases is fairly typical for the time. This means that the disease name provided may not be the disease we normally attribute to the name that appear on the map. In fact, some of these names are better considered more a description of a major symptom than a disorder. There is also some evidence suggesting strongly cultural-based interpretations may have been introduced in the text accompanying this map. Such is not an unexpected finding for the time period in which this research was done. It is also important to note the reference to the “Cold Zone” on this map, This represents the continuation of a technique used since the late 16th century to define three mostly climatically-based zones on the world map. This method of referring to regions was later popularized by Alexander Humboldt in early nineteenth century, who used it to refer to the inhabitability of different parts of the earth and ability of certain cultural groups to acclimate to these zones or regions. To the reader familiar with the three traditional climate zones–torrid, temperate and frigid–the defined Cold Zone is probably defined in order to be contrasted with its opposing region, the torrid zone. The exact location of a the third zone on a map, the temperate-like region, is most likely positioned on both sides of the Cold Zone boundary line. Due to the nature of the climate in this region, it can be surmised by the reader that temperate-like conditions are short lived in this Torrid Zone country, and will most likely be where some of the temperate zone diseases are defined. In terms of medical geography implications, the Torrid Zone consists of a tropical climate and is a part of the world where diseases seem to prevail. The vegetation is not only prolific in such as region, but so too is the density of faunal and floral features for each of the local physiographic settings. The Temperate Zone had its own classes of diseases to take hold, primarily of autumnal and winter onset and nature. The Cold zone may perhaps be considered akin to “Frigid” in some traditional sense, but less cold in an actual scientific sense, due to local climatic and topographic features and limits. Nevertheless, it is important to note that this is where the author notes two infectious diseases to prevail–smallpox and measles–a climate-based geography of these two diseases identical to that of North America. this begs the question: were these disease zones defined based on local climate, or the local “Cold” zone defined based on disease patterns? To a medical topographer reviewing this article during the late 19th century, about the time the germ theory was beginning to take hold, this system of mapping these diseases might suggests that a variety of causes for disease are expected to be present in each of these settings. Were the topographer who produced this map a believer in the miasmatic theory for disease, then he/she might conclude that the presence of long-lasting humid conditions and the observed mist arising from heavy forests on a daily basis during certain times of the year might be the cause for some diseases on a fairly regular and predicatable basis. An exploration of the varieties of plants native to a torrid regions can be fairly enticing to an explorer, but their association with the humid climate and stagnated water could also make taking such a trip a risk, for each of these features provide ways for the further decaying of debris to ensue, resulting in new forms of swamp gas or miasma, giving rise unhealthy air forming atop land surfaces rich in alluvial soils where moisture can be retained and where evaporation takes place to no avail. A typical medical topographer for this time might conclude that there are numerous new ways for diseases to develop, all of this evidenced by the disease maps and the varieties of fever- and decay-stricken bodies witnessed throughout their travels. The following map depicts Mexico and part of Central America as it might have been known to a sixteenth or century explorer. 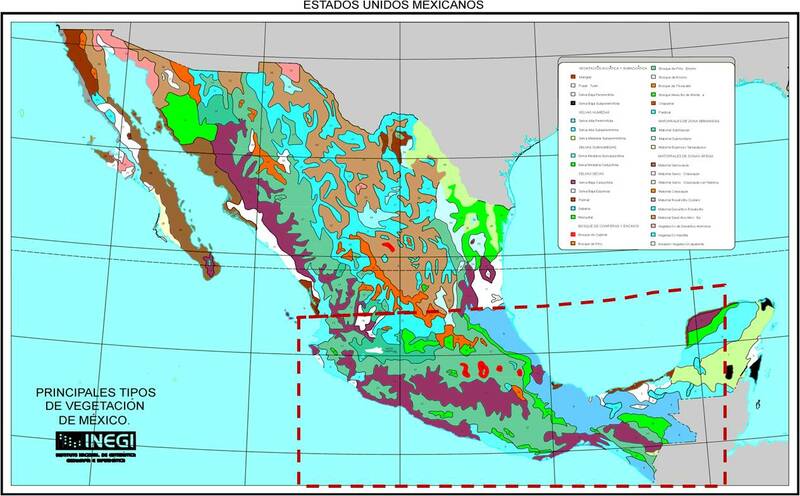 Like the division fo the earth into three climate regions to which certain diseases can be related, this map defines Mexico and Central America into three regions with distinct, well-defined climate-topographic patterns. Such a map might have been how some of the explroers following Cortez’s travels might have interpreted the major settlements that they came in contact with. To the medical climatologist, reviewing the above results might in fact be remarkabely the same, even though the logic was completely different. Aside from the torridness of the Mexico setting, the spells of exceptionally violent and long-lasting storms would no doubt be the primary cause for disease in this region according to many of these physicians. For this reason, certain measures would need to be taken to avoid certain weather-related natural causes for disease and death, such as avoiding the Yucatan during the most humid periods in the year when not unexpectedly many vicious storms can be seen regularly forming on the horizon (hurricanes). 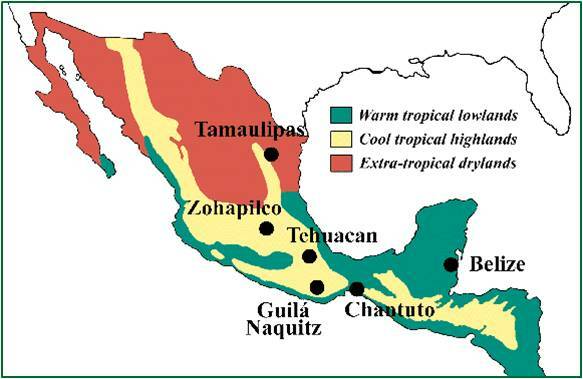 The drastic changes in seasonal temperatures and humidity would no doubt cause these types of travelers to assume that this climate and its weather features were the primary causes for the varieties of fever seen throughout Mexico, in particular along the lowlands situated right next to the Gulf waters. This would also be the reason they felt some areas to bear one type of fever that was mild and seasonal whereas other regions bore fevers that were more volatile and more likely to be fatal to their victims. 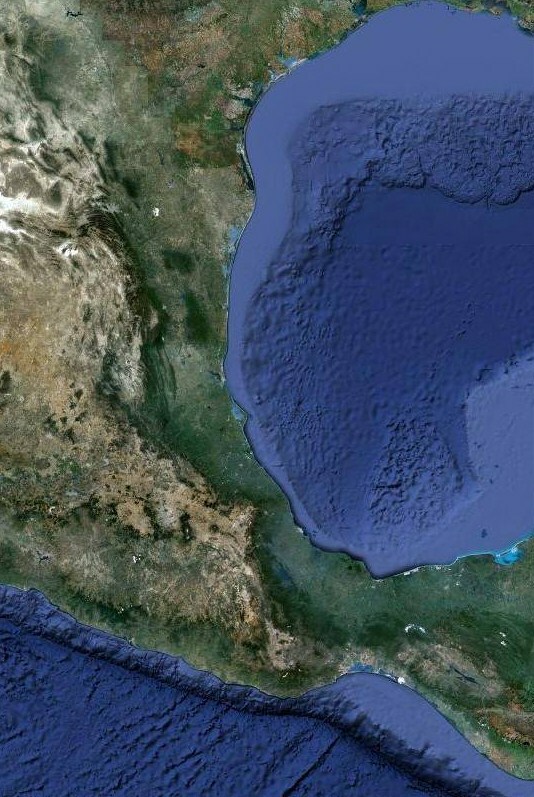 In the worst scenarios, victims of the lowlands of the Yucatan peninsula would no doubt be getting their consumption (tuberculosis) from the hurricanes and numerous thunderstorms passing through this part of Mexico, providing further support to any arguments made that any attempts by Europeans to acclimate to this setting could become unsustainable and fatal. Each of these two types of medical geographers also had the animalcules theory to contend with regarding their philosophy and scientific reasoning and arguments. To medical topographers it was the various land forms and plant-animal communities that were responsible for certain animal-based diseases such as intestinal worms. To climatologists its was the climates and weather patterns that were responsible for the swarms of mosquitoes to form, accumulating in certain places and resulting in yet another onslaught of disease patterns of possible “animalcule” origin. The witnessing of these natural events would also provide further evidence for both forms of medical geographers regarding their arguments for the theory of pestilence as it related to other epidemic diseases erupting in Mexico’s moist, tropical settings. By 1880, a number of theories used to explain the increases in diseases like yellow fever and malaria and the discovery of yet another new disease type specific to just a small region in Mexico. Between 1875 and 1895, the topographic, climatologic and animalcule theories of disease underwent significant change. The “germ” or “bacterial” theory was forming, mostly as an extension of the animalcule philosophy already present in medicine since the early 1700s. The main reasons the belief in animalcules did not take hold as strongly as the development of proof for a germ theory are not clear. The competition the climate pathologists offered animalculists could be one reason why. Another possible reason for this delay is the strong scientific evidence supporting the other theories that were already out there, and the surprising nature of the links that could be made between diseases and the other features producing the local landscape. Both animalcules and topography/climatic features were very much highly visible natural events; the presence of organisms invisible to the naked eye was unexpected to some not very credible. As a consequence of these arguments between theorists, it took one or two generations for the germ or bacterial theory to really take hold; in many of the annual professwional meetings, the younger physicians had to wait for the old-timers, who spent their lives practicing medical topography or medical climatology, to essentially die out. During the 1880s, the approximate time in which the above disease map was produced. The causes for most of the diseases were not known. Scientists were just about to draw the links between tuberculosis and fungi, and were still decades away from realizing that even much smaller organisms could be borne by mosquitoes which in turn were responsible for yellow fever. Likewise, the evidence that malaria was mosquito-borne, that many forms of pneumonia were bacterial in nature and that Pintos was due to a specifc well-localized organism was easy to read, understand and perhaps even relate to one’s medical practice. But during the 1880s, too many old-fashioned ways of treating disease still existed, and so by mapping them, these medical cartographers were preparing their field for the next generation of disease pathologists and microbiologists. The small pox (Pox) and measles (spelled out) epidemics require significant population densities to survive as a recurring epidemic phenomenon; thus their proximity to the urban setting Tamaulipas. Likewise we find the pox-ridden regions between the coastline (Acapulco) and Tehuacan (Mexico City) urban setting. Medical geographers consider pneumonia (Pn) a temperate and frigid zone disease. Likewise it is found in Mexico within the cool tropical highlands. Yellow Fever (Y) and Malaria (M) epidemic regions are within the lowlands close to the more active shipping ports for Mexico. Dysentery (D) also appears to more likely to occur in lowlands regions than in the extra-tropical drylands and the higher elevation cool tropical highlands. The same is true for Phthisis (PH), although its zones are distinct from those of dysentery. Typhus (Ty) is related to the urban setting; Typhoid (TC) convulsions to the western shoreline communities. Pinta (“Pinta”) appears in a very distinct area. We might normally relate this to something very specific to a cultural setting, such as a genetically acquired disease or a unique zoonotic disease relationship. Anemia (spelled out) and Geophagy (Geo) are in areas central to the Mexico-Central America isthmus. Bilious fevers occur all along the western lowlands shorelines and inland; it is a surprise to note their absence from the parts of the eastern shoreline, although the greater incidence of yellow fever and malaria may be a reason for their reduced emphasis in these regions. Each of the disease regions noted on the medical geography disease map has a fairly important story to tell. Reviewing their history requires a review as well of the history of Mexico demography and politics as well. By using this approach, we can make better sense of the disease map, making a number of interesting discoveries as well along the way regarding the culture of this region from its pre-colonial and colonial periods to its first periods of industrialization in the nineteenth century. Some of the medical conditions on this map have a long history related to discovery and settlement, going back several centuries. Others are reminders of specific colonization events that took place during and long after these early attempts to colonize ceased. Some of the more recently defined diseases for this time in Mexico’s history provide insight in the improvements made in the understanding of disease ecology and zoonotic disease histories, which in turn have been applied to some of mexico’s medical geography. Still other diseases provide us with insights into the early interpretation of genetically-based diseases in Mexico, and the various effects poverty and malnutrition probably had on this country about the time this map was produced. In spite of all these insights into Mexico that such a map provides, there are some parts of the Mexico lifestyle and disease experience that are lacking from this review. This map is primarily regionally based, and reviews diseases that prevailed in significant numbers in certain parts of the country. A number of much smaller diseases, some well localized were not well-documented at the time that this map was produced. For example, there was adequate documentation about the impacts of certain illnesses on the Yucatan peninsula, which for some reason the producer of this map excluded. At the time, industrial activities were in fact quite closely linked to Yucatan occupations and behaviors. It was not rare for chicleros for example to experience their ulcers and ear malformations due to their outdoor work environments. It was not unusual for the various seringueros, or local versions of tree-fellers, to experience disease as well as a result of their occupation. The majority of diseases reviewed on this map are perhaps those most often witnessed and best understood by the generations of settlers occupying certain parts of Mexico from the 15th century on. Nevertheless, this review of this disease map of Mexico and several adjacent countries provides important and helpful insights into this period of time in Mexican Medical Geography history. Until the end of the first quarter of the twentieth century, disease names retained a fairly symptomatic or appearance based naming terminology. A more complete understanding of physiology and pathology was required for disease identification and recognition to be developed into the form we are more familiar with today. As a result, the major problem with historical documents is that one disease name could refer to one or more maladies. The term typhus at this time did not differentiate endemic typhus from epidemic typhus; the term anemia did not different an anemia induced by poor nutrition, from one due to a personal genetic history, or from a symptomatic anemia related to chronic blood loss such as that brought on by sickle cell. In essence, the first task therefore is to determine what all the options were for the diseases being described, and then determine if these diseases and population/human-based or a consequence of nature and the environment. The first is a geographic condition produced due to regional demographics, the second due to regional environmental and ecologic features. Still both can bear the same name. The following diseases are noted on this map. Included is a review of the names given for each disease and the definition of each based on a contemporary reference for the time–Dunglison’s Medical Dictionary (1867). Their contemporary names and related noted are provided in parentheses. Generally speaking, Smallpox and measles are the well-known highly contagious diseases important to Indigenous-New World medical history. These two maladies require direct human-to-human contact to be passed on to new victims, and are of Old World origin. Pneumonia and phthisis are infectious pulmonary diseases; pneumonia can be either bacterial or viral, and tuberculosis fungal in origin. Typhus and typhus convulsions may be different forms of typhus, but they lack of any mention of typhoid fever suggests that perhaps the authors may have been referring to severe cases of typhoid fever, those which can result in febrile convulsions. ‘Marsh Fevers’ most likely refers to malaria, and the fact that a plural is given suggests that the multiple day cycles of this fever are known by the author. For example, with Malaria referred to as Ague as well, one-, two- and three-day agues are common variations of this febrile condition, meaning that the fever remits or is reduce for a while before returning again one to three days later. “Bilious fever” is referred to separately from “Yellow Fever.” A decade or two earlier, these two names for fevers may have been used interchangeably, but by now, the distinctions between the “Yellow” and “Bilious” Fever have become much better understood. The ancient humoural theory included biles that were in the form of two colors–yellow and black. But by this time, yellow could be easily distinguished from other Biliary forms in that the former produced a yellow tone to the skin and at times a yellow vomitus, whereas the latter produced a vomit that was black to dark green in color. Many physicians at this time were well able to distinguish blood-based “black” vomitus from the dark green exudates contained in the stomach that are not blood-derived. So the yellow fever obtained its name in accordance to its appearances, and the other bilious forms of fever restricted mainly to those febrile conditions associated with black to dark green vomit. Dysentery is probably in reference to severe diarrheas in which bloody are substantially darkened and discolored stools are produced. The traditional dysenteries for the time were produced by poor sanitation practices and exposure to human waste contaminated waters. It is also possible however that amoebic dysentery may be inferred from this term as well. The former is bacterial induced, the latter is microbial produced. It is also possible that another diarrheal type of condition, giardiasis, induced by contact with Giardia, may have been included in the dysentery category by the author. Each of these forms of dysentery have well defined topographic features, enabling the most appropriate forms of dysentery to be identified as part of a later review of this part of the disease ecology analysis. Anemia and geophagy are listed together because geophagy has some relationships to anemia and the anemic condition. Anemia on the other hand is a much more complex form of blood-related disease. As a later review of this medical diagnosis will demonstrate, there are multiple interpretations possible about the anemia diagnosis and its locations. There may in fact be more than one type of anemia referred to as well, something physicians would not really realize until a century later. Anemia is a term used to refer to individual demonstrating poor blood volume or poor blood-related oxygen delivery in the body, usually indicated by a pallor complexion, but no symptoms of anoxia such as blue cyanotic lips. Geophagy on the other hand is an eating behavior or practice, which could be psychologically and/or culturally-based, such as the performance of this as part of a ceremonial practice or the like, but more than likely this referes to a pica practice in which soil is consumed for reasons related to poor nutrition or malnutrition, and often iron deficiency, a condition often referred to at this time as Chlorosis. Geophagy can differ from Chlorosis due to the lack of the green biliary vomit often related to this condition. In a study of Jamaican culture, geophagy demonstrated a tendency to be linked to African migration into this setting, suggesting a similar relationship might exist as well in certain communities in Mexico with an African heritage. Goitre is a malnutrition based disorder. It has very clear symptoms and so is probably not also used to refer to other malnutrition disorders such as scurvy or beri beri. The fact that there are no scurvy or beri beri regions suggests that, other than the Iodine deficiency condition often related to goitre, as a result of specific culturally-defined dietary practices, this goitre is the same condition as it is today– the result of malnutrition resulting in a swollen thyroid and the related deformation of the neck. Pintos Malady is an infectious disease related to fungal exposure. It is kept distinct from the other fungally-based infectious disease due to fairly limited geographic distribution. This condition is so well localized that it is given a very region-specific name, referring to a specific Mexican cultural setting. The term “Pintos” refers of course to the Pinto horses (for which the Pintos beans are named after), which is characterized by its mottled color patterns bearing numerous large discs, spots or dots of differing colors scatter here and there. The term ‘pinto’ is in turn a derivative of ‘pinta’, which is spanish for ‘horse’. The author calls this disease ‘Pintos Malady’, but it is more appropriately referred to as ‘pinta’. These diseases may be placed into categories of disease type based on several methods of disease classification. In the above listing, diseases 1 through 4 are considered infectious and are passed either through direct contact (1 and 2) and/or through suspended water droplets (pneumonia) or infected tissue particulates (tuberculosis), usually released by a cough. Diseases 5 through 9 are typically zoonotic and are animal host and/or vector related. The first two (5 and 6) are either endemic and rodent-related, or epidemic and human related. The next three (7-9) are primarily mosquito-vector related, although it is possible that some cases the bilious fever may be completely bacterially-based. The dysentery, assuming it does not include simple problems such as diarrhea, may be either microbial, bacterial, opportunistic bacterial, or viral-based. Microbial examples include the typical entamoeba (Amoebic) dysentery, and perhaps Giardia, although the symptoms of Giardia are perhaps more similar to those of Typhus due to the related pain, bloating and gas that often occurs with this condition. The bacterial examples of dysetnery are primarily shigellic-induced forms of dysentery or bloody diarrhea, but may also be salmonella-based opportunistic forms of animal body or debris origin (i.e. an animal-related Salmonella intermedia infection). Phthisis, later known as tuberculosis and previously referred to as consumption, is very much a climate-elevation dependent illness. Although this is known at the time, this knowledge about phthisis was perhaps commonplace and expected to be borne by any reader of this map or article. The elevation requirements of Yellow fever are noted, but not those of Marsh Fevers. Based on location (Yucatan peninsula), perhaps one of the most important sustaining environmental features for Phthisis is humidity; later scientific studies of tuberculosis in fact support this suggestion about its distribution based on the disease map. Anemia is typically genetic or environmental-behavioral based, and not transmissable. There are numerous causes for anemia that require special reviews due to the likelihood that these Mexican cases may be of various forms. Even though it is mapped separate from anemia, geophagy has many of the same features as anemia. Assuming it is not psychological or culturally-bound in nature, this kind of behavior could be anemia related. The otehr possibility is the act of geophagy is a culturally-bound behavior linked to important lifestyle practices within the traditional setting. This too requries a more extensive review to be completely understood in the context of where it is taking place on the disease map. Pintos Malady is a condition unique to the area and has the same infectious and contagious features as another disease not on this map–syphilis–but has its own very well localized topographic, pedological and ecological requirements. This is an example of a disease that is produced by an organism that has somehow changed it biological processes due to specific local features that as of yet have not been defined, even following the use of modern technology and research to perform this task. The following related maps or images are focused on the “Marsh” and Yellow Fever regions indicated on the map. Note the propensity for vegetation zone 5 (moderate blue) on the accompanying map to occupy these two regions. This zone is described as a perennial flora habitat existing on a fairly flat and level land surface–the perfect mosquito-breeding environment asuming there are adequate shade tree settings. For convenience, the dashed red lines on the following illustration approximate the boundary of the above disease map. For review purposes, areas outside of this boundary are included in the section extracted from this base map, which appears below it, for closer review. In medical typographic terms for the time, this suggest that several geology-related causes could be at play for causing the yellow fever outbreaks. Steep hills and cliff faces typically have talus cones at their base, and those which are of considerable age even have alluvial fans laid out due to ongoing drainage and gravity-related gravel and debris settlement activities. For several decades, these particular landforms were most closely associated with a variety of epidemic diseases, in particular Yellow Fever and Asiatic cholera, two of the most frequently recurring epidemics of the first half of the nineteenth century. At the northern end of the Yellow Fever boundary line there is some squiggling back and forth in the line form, occuring on the above map in a region that is more grayish, suggesting it is poorer when it comes to floral features. If this image reflects the same ecology as more than a century ago (a big IF), then we could conclude that some sort of boundary existed in this gray-zone that was a major limiter to how the yellow fever behaved. It is possible that water availability was severely limited in certain parts of this area, and/or that specific foliage requirements were on and off lacking such as the presence of specific shade trees (often a preference of mosquitoes). North of this boundary end, the distribution of yellow fever becomes less discernible or predictable based on the map. 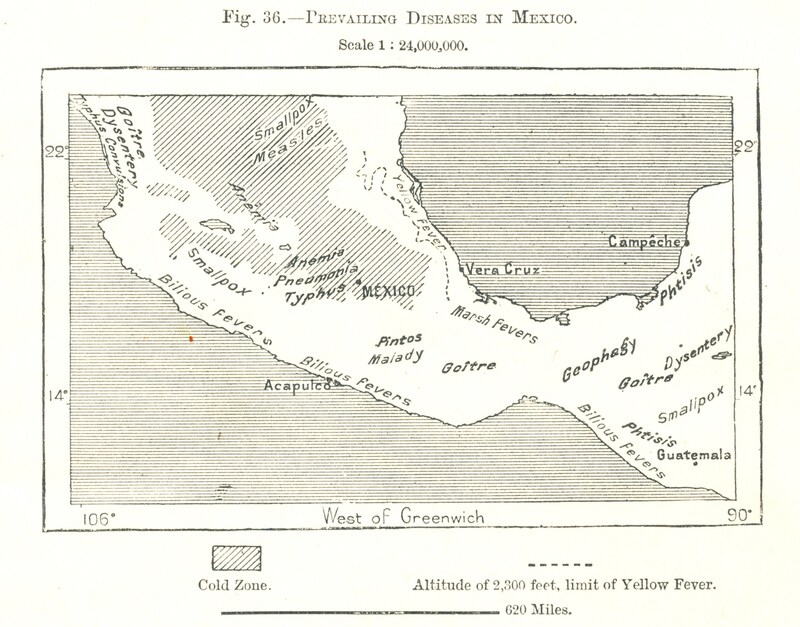 Next to yellow fever, the Marsh Fever was one of the most recurring, deadly epidemic diseases to come to Mexico due to exploration, settlement, cohabitation and commercial shipping activities. Like Yellow Fever, Malaria required a mosquito to serve as its vector. In this case, the culprit was any of a number of Anopheles species, but in many cases also became a result of other local Anopheles species. The first cases of Malaria to infect European explorers and travellers came from Africa, but for obvious reasons were well-prepared for their transport to the tropics of South and Central America during the 16th and 17th centuries. Because the malaria was mosquito-borne and spread, there were several very important topographic requirements for the pathogenic organism and its vectors to reside in identical regions. Lowlands with ample amounts of water, humidity, shade-sources and heat were required. This meant that ascending a mountainside too much would make the large amounts of warm water sources too scare and the climate too cool to allow for complete epidemic seasons to be formed and erupt on behalf of the pathogen and its mosquito vectors. Nevertheless, this limiting factor did not have so clearly an influence as it had with yellow fever, for which a specific elevation measure could be defined, above which the yellow fever stopped occurring. The warm wetland regions were pretty much the defining nidus or nest for this disease, and provided the natural recources for all biota involved with its development to continue to give rise to new malaria epidemics. It is also possible that since the term “Marsh Fevers” rather than “Marsh Fever” was used that more than one form of “malaria” existed. Fortunately, such is the case for malaria, a febrile disease that can result in multiple forms of febrile cycles, ranging from recurrence of a fever once every 24 hours to recurrences every 3 or 4 days. These cycles were mostly dependent on the life cycles of the microbe or animalcule linked to the malaria, one of the first truths about this illness that would be discovered, proven and summarized with the development of the germ theory and its related research during the 1880s. At the time this map was made, the cartographer-anthropologist who produced it probably did not have much information on the exact cause for Malaria. As a result he is reviewing along with other forms of fever as a unique fever-related illness with its own unique geographical requirements. Whereas Yellow Fever tends to prevail in places where ship dock and ind international travel and commerce ensue, Malaria tends to occur in the outskirts of these economically active regions. In the case of this map, it is inferred that Malaria occurs in a fairly swampy or marshy region, one in which an abundant supply of vectors reside, with the potential for impacting local animals and people. Another significant feature of the marshlands occupied by Malaria is the extent to which this marshy lowland region traverses the isthmus. 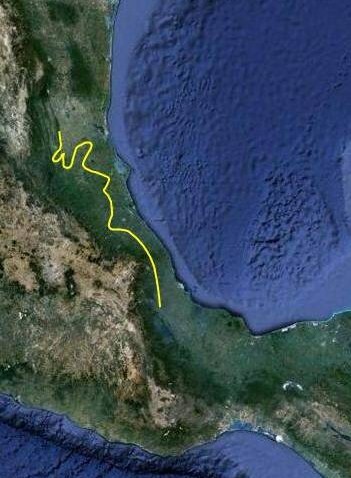 During this period in Mexican and Mexico-America history, this narrow piece of land was often used by industries, military groups and other travellers in need or rapid transit across the isthmus. This type of travel need made this part of the isthmus active enough for some of these travelling methods to effectively carry marsh fever well inland, perhaps even to the western shores. Some of the better known industries for the time to be engaged in such activities were the lumber and latex industries, which at times gathered their products as far east as the central and eastern parts of the Yucatan peninsula, only to send them across the isthmus by small trains in order to speed up the delivery of these resources to west coast industries located north of Mexico, as far north as Vancouver, Canada (these lumber-latex industries peaked and remained ongoing from 1875 to the opening of the Panama Canal in 1914). An important side note to mention regarding the malaria was the well-known treatment for this illness that was also exceptionally effective. The quinine tree or Cinchona has its roots south of Mexico, but can reside locally in Mexican and Central American settings. In addition, several other species of Cinchona were known to reside in these areas as well, but never really had the impact that the true source of quinine had on malaria epidemics. The fact that marsh fever was recurring at this time suggests that in spite of nearly a century of knowledge and discovery related to quinine use, there was a significant problem with malaria still occuring within this part of Mexico. This may be due to either an early development of quinine-resistant versions of the organism responsible for this disease, or a lack of sufficient drug supplies for the local communities with the highest risk to catching this disease. The prevalence of goiter in a region is usually an indicator of poor iodine consumption as part of the local dietary practices. The symptoms of goiter are primarily an enlargement of the neck due to enlargement of the thyroid gland in the neck partly surrounding the trachea and esophagus. The most geographically-related cause for goiter is the edible cassava root. In more recent terms, goiter can also be induced by way of exposure to radiation and various toxins capable of reacting with thyroid or iodine binding and absorption cells and tissues. The most modern version of this thyroid condition to be idenfied is Hashimoto’s Disease, which may have some autoimmune origins. Another autoimmune disease commonly related to thyroid problems is Grave’s disease, which presents in the same manner as nutrition-induced goitrogenesis. In terms of dietary-related causes for the goiter noted in Mexico, gardening or agricultural food-related traditions practiced significantly inland can result in such a condition. This problem is often exacerbated by the farming of a variety of Brassicaceae or Mustard/Cabbage Family edibles, ranging from mustard greens and other leafy vegetables to the raising of cabbage, broccoli and cauliflower-related crops. Within some traditional Mexican settings this could be a source of the goitre noted on the map. It is also possible that cassava root (Manihot esculenta) could be the primary cause for this condition. Cassava root starch contains cyanogenic glycosides such as linamarin which can be converted into a fairly toxic form of cyanide as part of the preparation and cooking process. Since indigenous methods for preparing cassava were developed to remove these cyanogens, any chances for fatal ingestion is minimized, yet the likelihood for other chemical interactions within the body can be increased. Such may be the case for cassava. In general, since cassava tends to prefer dry or xeric landscapes at lower elevations, topographic analyses could help to determine if the goitre noted in some parts of Mexico are associated with cyanogen-induced goiter, or poor nutrition-related goiter. Pinta is a skin condition that occurs in Mexico, Central America and South America. It is caused by Treponema pallidum carateum, an organism quite similar in biology and genetics to the Treponema pallidum associated with syphilis. The ability for a bacterium to evolve within a given region is obviously quite possible, and this version of Treponema is no exemption to this evolutionary concept. The prevalence of this version of Treponema is not unique to Mexico’s epidemiological history. As early as Chris Colon’s arrival to the New World in 1492, it was possible for this form of sexually transmitted disease to make its way around the world in exchange for equally contagious forms of measles and small pox left behind by the same sailing crew. The most noticeable feature of those infected by this bacterium is the mottled skin, with varying colors and sizes of the patches that are formed. The resemblances of these patches to the mottled, marble-like patterns found on Pinto horses naturalizing to this region is the source of the name for this condition. Pinta is transmitted through direct skin-to-skin contact rather than through mucosal membranes like the related Treponema pallidum when it is responsible for syphilis. Two to three weeks following transmission the area in and around the point of contact erupts to form a papule, which ultimately becomes dry and scaley enabling the skin to flake off. Three to nine months later, thick, flat patches are formed all over the body which can remain there permanently at times resulting in reductions and increases in the natural pigmentation process scattered about the body’s surface irregularly. Two other conditions, yaws and a bejel are skin disorder which act in similar ways, causing some medical geographers to group these conditions together in some of the earlier writings on these conditions. Yaws and bejel are both due to Treponema pallidum, the organism also responsible for syphilis. Pinto is covered in detail on a separate page: Pinto, Yaws and Bejel. A series of very inventive maps were produced depicting the distribution of these cultural-bound and cultural-linked diseases in the US. Also, a section on cultural disease and syndromes as these relate to the changing health care system was developed as well for the western states, rural regions in need of large area programs of integrated health care (again the new federal health plans require some of this as of 2013). Links to these follow. For more on culturally-bound syndromes in general (not just Mexico): link1. For more on culturally-bound versus culturally-linked (this term is my invention), see: link2 and link3. For a page on how to engage in this form of improve health care targeting ethnic and special needs groups, and the theory, see: link.